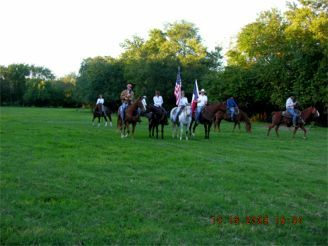 On October 16, 2009 a beautiful Friday evening at 5:30pm, a Trail Ride with 12 Cowboy/Cowgirl Horse Riders and a couple of Low-boy Trailer Riders were attacked/hi-jacked by about 20 Indians attempting to move through a low Willow Creek water crossing. 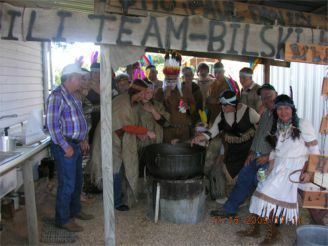 The B-Branch and Willow Creek Comanche Tribes were attempting to collect a toll for the Willow Creek water crossing, but the Cowboys/Cowgirls and the Low-Boy Riders were not willing to give any cash. 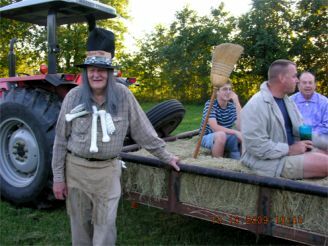 The Trail Ride was halted by none other than the Medicine Man - Ralph Hopcus, who was sitting on a chair with his piece by his side and many bones hanging around his neck, raised his right arm for a "Halt" signal. 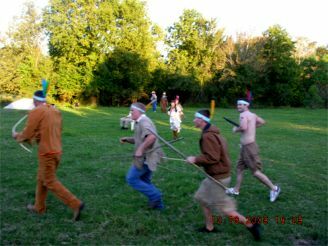 After some back and forth sign signals between the Medicine Man and the Trail Ride Foreman leading to no good communication, the Medicine Man directed Chief Running Bull - Willie Kempinski and Chief Funny Bull - Ed Okonski with their warriors to surround/attack the Cowboy/Cowgirl Horse Riders and Trail Low-Boy Riders and collect the toll. 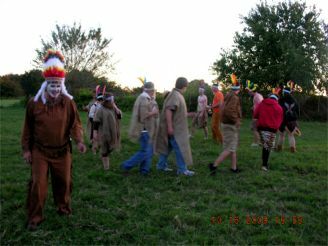 All of a sudden, approximately 20 warriors began appearing out of the creek and from behind trees led by Chief Running Bull and Chief Funny Bull. 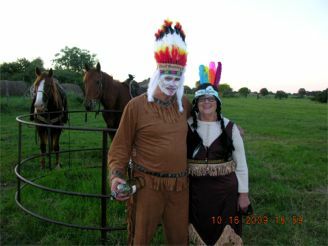 Tonka - Tinka Hopcus immediately raced out to her husband, Medicine Man, to satisfy her first priority of ensuring his well being. 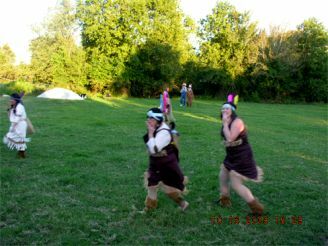 Run Away Squaw - Virgie Kempinski side-kick to Chief Running Bull, Cherokee Blossom - Charlene Broome, Pocahantas - Stella Pruitt, and Navahoe - Susan Green were some of the more vicious warriors leading in many of the treacherous sounds and wild dances threatening Cowboy/Cowgirl Horse Riders and Low-Boy Riders with their homemade bow and arrows made from Willow tree branches. 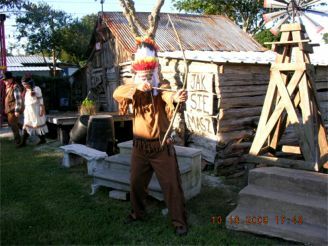 Chief Running Bull with his decorative Headdress and outfit also had a homemade bow and arrow and reassured everyone that no one was going to cross the creek with swift moving water until an acceptable toll was paid in cash or with other valuable and tradable items. The warriors were getting louder and more out-of-control. 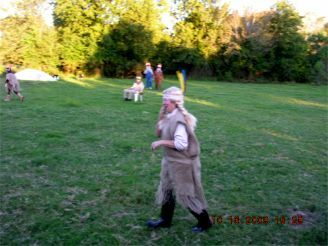 The Trail Rider Foreman offered some Firewater and sweet potatoes for the Toll and was quickly rejected by Chief Running Bull. 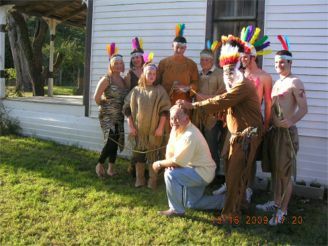 Chief Running Bull said they make their own Firewater and have plenty of it and could raid the town gardens for all the sweet potatoes they want. As the warriors circled the wagons, the 12 Cowboys/Cowgirls horses began to get spooked and backed away from the warriors. 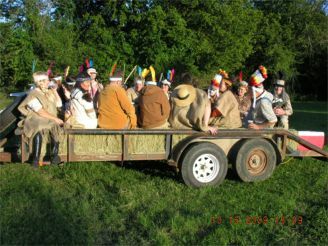 Medicine Man and Chief Running Bull were getting restless and demanded taking of several new squaws from the Low-Boy trailers to help grow the B-Branch and Willow Creek Comanche Tribes. 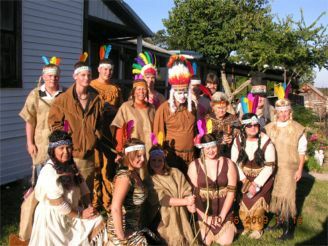 After the third initiation of a new squaw, the Trial Ride Foreman offered a deal the Tribes could not refuse. 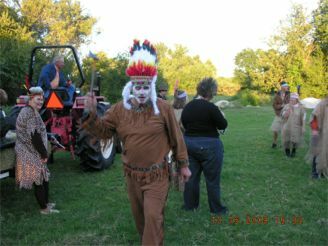 Medicine Man, Chief Running Bull and Chief Funny Bull accepted the deal of joining the Trail Riders for the continued trip and taking of pictures, invitation to the Ok Jamboree the next day, invitation to the St Mary's Bazaar and invitation to possibly a larger Show next year. 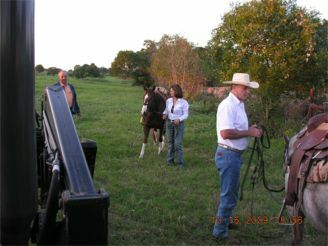 All the amateur actors and Trail Ride participants enjoyed the Event and had a least a 30 minute Laughing Attack during a beautiful Fall evening on October 16, 2009. 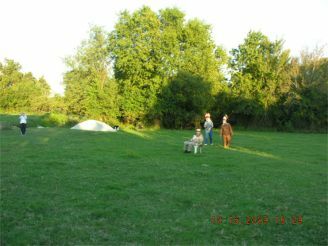 Event was described as one of the best Outdoor Theater activities every attended. Movies and many pictures were taken. 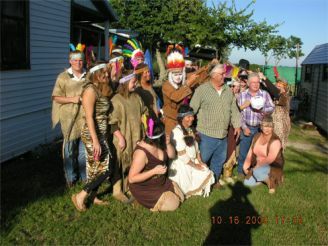 Many of the participants/casts were descendants of the original settlers of Tidwell Prairie.